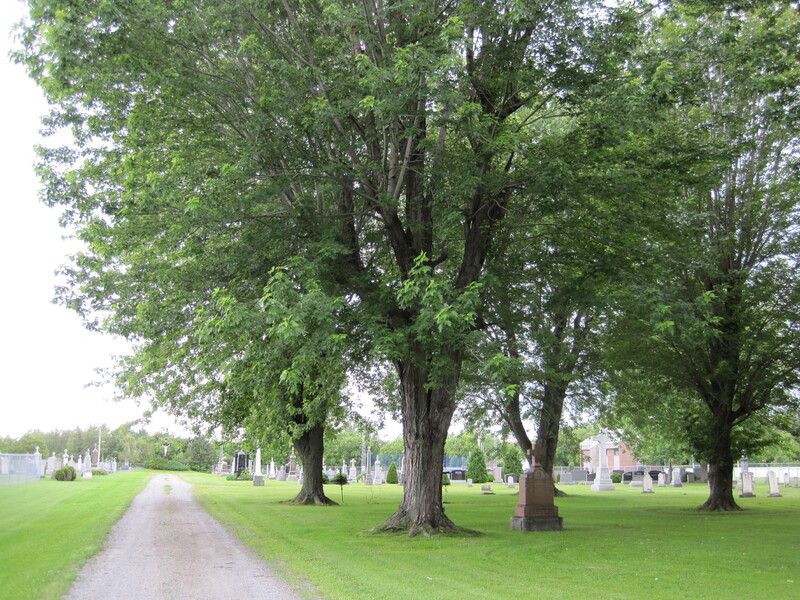 In 1851, François Tourville was living in St-Jude, Québec, with his wife Louise Corriveau, and their children: Marie, Alexandre, Léonard, Marie-Louise, Luc and Célestin (Louis). In 1860, his wife Louise was living in Sutton, Worcester County, in Massachusetts. We can assume from the Census that she is a widow. Lucky enough, I found two contracts signed before notary Timothée Brodeur in St-Hughes to give us a hint about when François Tourville died and confirm the fact that Louise Corriveau was indeed a widow when she moved to Massachusetts. The first one is dated February 14, 1854. 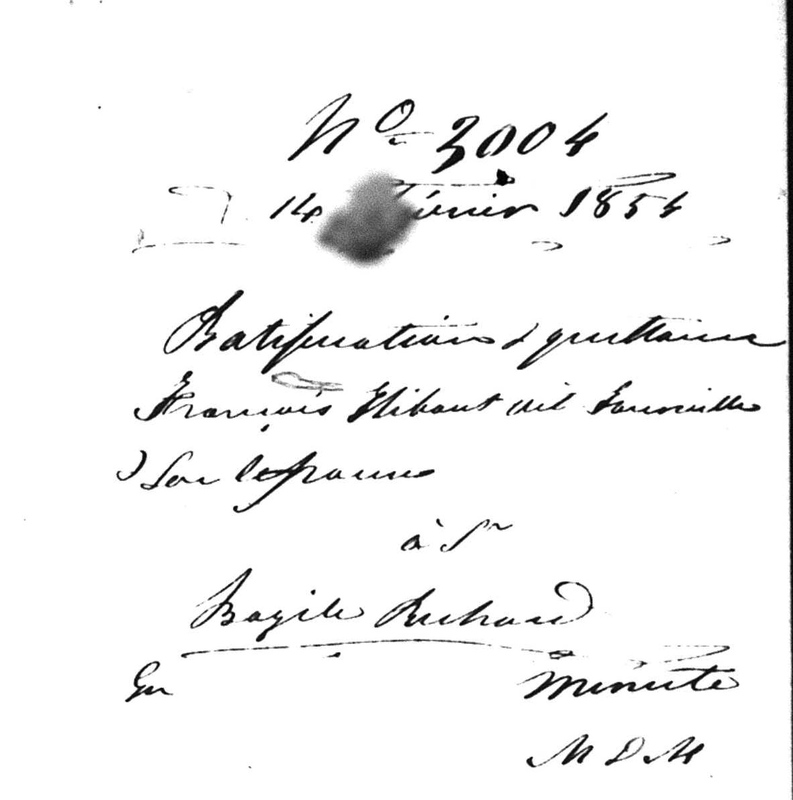 The document states that François Hubou dit Tourville and his wife Louise Corriveau, both residents of St-Jude, acknowledge receipt for the fourth payment that was due last January “of this year” for the sale of a land that was made by François to Bazile Richard, on March 30, 1850 before the same notary. The buyer is the owner of the neighbouring land. Act No. 3004 dated February 14, 1854 before notary Timothée Brodeur. 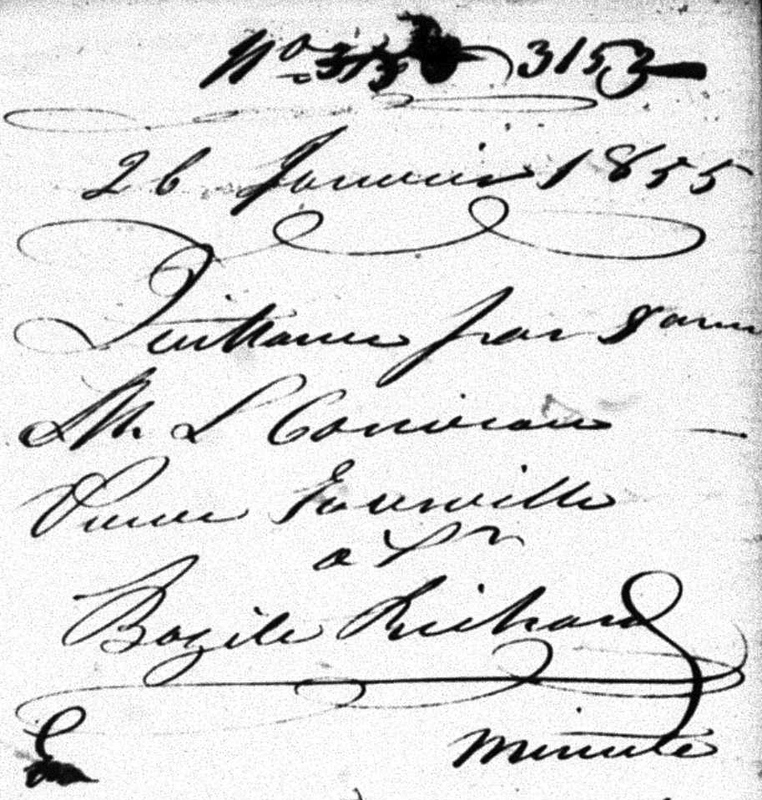 The second contract was dated January 26, 1855 where Louise Corriveau, widow of the late François Tourville, resident of St-Jude, acknowledges receipt for the last payment regarding the sale of a land made by the late François Tourville, to Bazile Richard. Act No. 3153 dated January 26, 1855 before notary Timothée Brodeur. I have checked the St-Jude and St-Hughes church records for 1854 and early 1855 and I haven’t find anything. Was François planning to move to Massachusetts and he died on his way to the States or in Massachusetts? When his son Alexandre married in 1856, he states that he is from the United States. Did the family leave right after receiving that last payment? Généalogie Québec has baptisms, marriages and death entries indexed until 1850. When the years 1854-1855 will be indexed, maybe we will find his death record in another parish. Both documents have been uploaded on the Website on the pages of François Tourville and Louise Corriveau. At least, we now have a timeframe to continue the search. If my father was still alive he would turn 100 years old today. See this picture? Do you know where I found it? Not at home but at the Québec National Archives Center in Montréal. My father got married when he was over 40. His parents were poor. I only have a few pictures of him, mostly from the fifties. And these pictures are kind of small, not very clear. A few years back, I was at the Québec National Archives Center in Montréal on Viger Street. I was looking at binders and something caught my eye. The Studio O. Allard Fund. I know what Studio Allard is. My student card photo was taken by this studio. Intrigued, I decided to look at the microfilms and went directly to the name Tourville. I was so surprised to read the name and address of my father before his marriage! I went to the counter and asked what was in those files? Negatives they told me. I ordered the file and the clerk opened it before me and said: no negatives but pictures in this one! I discovered a picture of my father that I have never seen before, that dates back from 1945. He was 32 years old on that photo and I was ecstatic! We find tons of things on the Internet but nothing compares to a visit to an archives center. My father was no celebrity nor big shot but I did find a portrait of him at the Archives. If I wasn’t into genealogy, I would have never found that picture of him. The Studio O. Allard contains more than 1 800 000 portraits and shots of Montreal shops ranging from 1930 to 1990. Wherever you live, a visit to a provincial, state or local Archive Center is worth the trip.